I have still been making the odd card, but life just got so busy that is was really hard to find some spare time. I've decided to start making a few changes, so that I can spend some quality time with the family, plus get back into this hobby I love. I've made a card that was inspired by two challenges, the CAS on Sunday - use a repetition image, and Less is More - shimmer. I used the butterfly die from Concord & 9th for my repetition background, and the My Favorite Things Hugs die which I die cut from paper I had sponged some distress oxide inks onto. I added some Spectrum Noir sparkle pen to the Hugs die for some shimmer although it's hard to see in the photo, along with some Pretty Pink Posh sequins to finish it off. So so pretty! 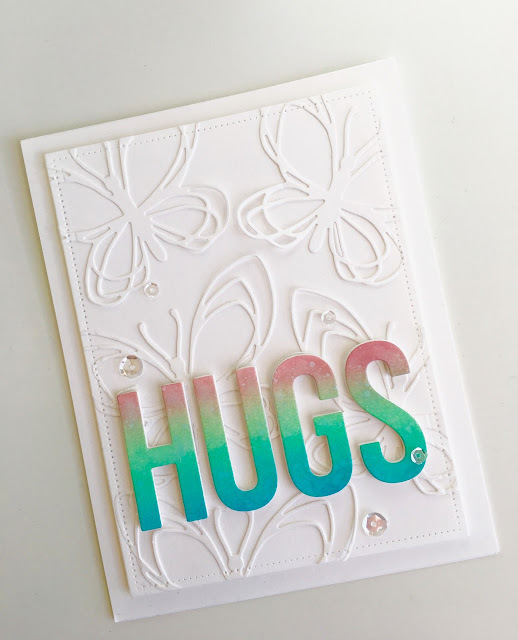 Your fantastic colored sentiment just pops from the all white base and I love the dimension and detail the butterflies give to your design! Thanks for joining us at Less Is More Challenge! Very pretty! love the color on white! Welcome back Tracy! Your card is lovely. The pops of colors look wonderful with the fancy butterfly background. You haven't lost your touch!! What a gorgeous combination of challenges ! I love your butterflies die cuts background, so pretty and it makes such a gorgeous contrast with this bold coloured sentiment ! Beautiful and soft touch of shimmer too ! Thanks so much for sharing and for playing along with us at Less is More ! Welcome back Tracy and such a gorgeous card love the background. Thanks for joining us over at CAS on Sunday.